Legislation and Advocacy | California Trout, Inc.
CalTrout has deep roots in using advocacy to create change. From day one, we championed wild trout management and the concept of catch and release, spearheading efforts to enact programs and legislation to protect California’s trout resources. We continue in those efforts today by engaging targeted legislative members and staff on key local, regional, and statewide issues. Retaining a political consulting firm to address State issues, CalTrout identifies key decision makers and builds enduring relationships with them, supporting their leadership on issues that advance the mission and programs of CalTrout. CalTrout brings policy expertise, on the ground experience, community support, science, media, and advocacy experience to advance mission-critical policies programs and funding. Using an experienced team of consultants to complement our executive staff, we develop legislative initiatives, support or oppose legislation, help shape the state/federal budget, engage in stakeholder groups and work directly with key decision makers. CalTrout has followed the progress of Prop 68 since it was an idea hatched in the legislature last year. Before Prop 68 landed on the June ballot, it was first passed through the California legislature as SB 5. 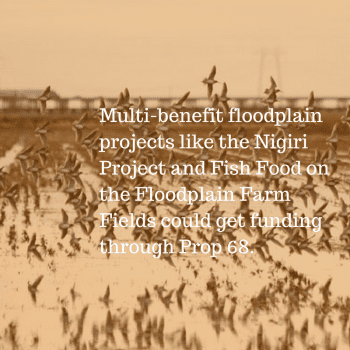 CalTrout worked to ensure that the Bond measure included natural resources funding and we succeeded in securing language that included funding for multi-benefit flood plain projects (Nigiri) and for barrier removal projects (Matilija). Once passed out of the legislature with language we could support, CalTrout continued its efforts to support Prop 68 leading up to the June ballot. CalTrout joined the Executive Board of The Committee for Clean Water, Natural Resources & Parks, which, together with other conservation and urban parks groups, advocated for the passage of Prop 68. Although we will continue to advocate for natural resource interests outside of bond measures, we are pleased that Prop 68 passed. This year CalTrout has sponsored Assemblymember Bloom’s AB 2528 measure, which highlights some of CalTrout’s key areas of interests: source watersheds, mountain meadows, strongholds, and estuaries. Every three years the Natural Resource Agency produces a research-heavy Climate Adaptation Strategy paper, and AB 2528 would make sure that these four climate resiliency areas are analyzed for their importance in the climate change and climate adaptation conversation. 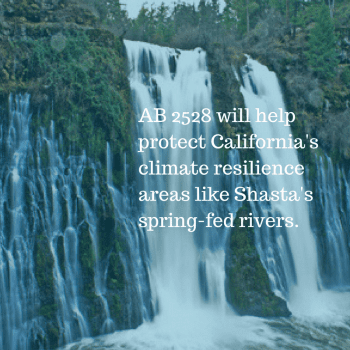 AB 2528 addresses gaps in protections for California’s most resilient watershed, riverine and coastal ecosystems in the face of unavoidable climate change. This bill calls out these “resilience areas” because they have either fallen into protection gaps or because California has not yet made it a priority to protect the best remaining resilience areas. STATUS: AB2528: Now has passed through the Assembly entirely and sits in the Senate (where it waits for a vote after passing through Senate Natural Resources and Water Committee). 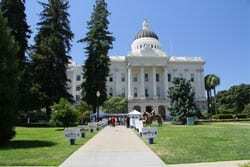 Please check in with CalTrout in September to see if this bill has passed! Although CalTrout does its best to be a productive partner in the policy world, sometimes we use our influence to oppose bills that we view as potentially harmful to our interests. AB 3102: CalTrout is opposing AB 3102 SB, which is a repeat bad bill intended to limit environmental review for projects that require California Environmental Quality Act and fall under the Fish and Game Code authorization for lake and streambed alterations. Simply put, this bill would make it easier for water districts to move dirt in potentially sensitive ecological areas. AB 2649: CalTrout is also opposing AB 2649, which makes groundwater recharge a per se beneficial use of water in California. This is a major change in water right’s law, but beyond that, it categorically allows for potentially contaminated water systems to recharge potentially pristine groundwater systems. This is a dangerous precedent to set and one CalTrout opposes. When CalTrout does not directly author bills, we oftentimes will pledge our support of legislation that reflects our core mission and values. AB 2975: CalTrout is thrilled to hear that Assemblymember Friedman is authoring AB 2975, which would counteract any federal move to delist or remove protections for Wild and Scenic River systems in California. AB 2640: CalTrout also supports Assemblymember Wood’s AB 2640, which would authorize a temporary take permit for the short-nosed sucker. While this has the sound of a potentially bad bill, this is part of a planned strategy for the removal of all four Klamath Dams. Once these structures are removed, CalTrout believes that the health of the Klamath River will support both suckers and salmon at numbers not possible before removal.